The King of Kings Has Arrived! iRiver, the king of MP3 digital audio players were competing with Apple for this market segment. Ironically, they have turned full circle and are now strongly advocating audiophile sound quality. Astell&Kern brings you the original sound, right at the moment of the studio recording and before the compression format of the CD, just the way the sound is meant to be heard. The AK120 Titan takes the story a step further with twice the memory of the AK120, two DACs and twice the output of the AK100 model. Get the tissues out... Prepare to Drool! The Astell & Kern AK120 Titan portable audio system is an audiophiles dream player. Like its predecessor it is capable of playing Mastering Quality Sound files (MQS) from online stores like HDtracks.com however it also supports the Direct-Stream Digital (DSD) Super Audio CD (SACD) format, in addition to a slew of other lossless formats like Ogg, FLAC, WAV, WMA, APE and yes, even MP3 audio files. Unlike its predecessor it packs 128GB of internal built in memory, sports 2 micro SD card drives that can each take a 64GB card (yes that is a total memory capacity of 256GB) and instead of one Wolfson 8740 DAC, used by high end Hi-Fi manufacturers such as Linn and ARCAM, the AK120 Titan has two. Two DACs why? I hear you ask, the AK120 Titan uses a DAC on each channel giving you completely seperate, isolated left and right audio channels. The AK120 Titan is enveloped in a beautiful brushed aluminium casing, a finish that defines fine craftmanship and a strive for perfection. The design of the volume wheel protector resembles the bridge of a stringed instrument and hints at the enriched sound output from the AK120 Titan. Luxurious details are not missed at all with the AK120 Titan. The red ring wrapped around the volume wheel is a design statement of the Astell&Kern identity and the fine craftsmanship of all metal components reassures the long lasting quality guaranteed from Astell & Kern. 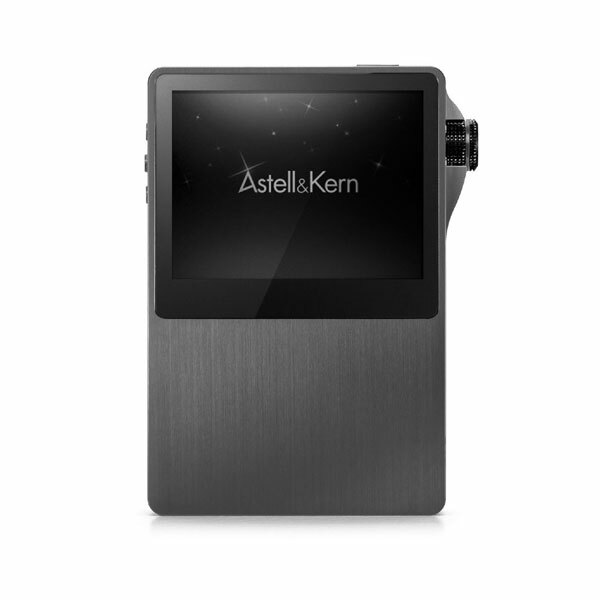 The Astell&Kern is a digital device with an analog ambiance. The volume wheel also provides analog musical inspirations that are not often found on typical push-button volume controls. Mastering Quality Sound (MQS) is an acronym of collective lossless & high-resolution audio source formats, typically in 24-bit/44 to 192kHz of bit/sampling rates. Because MQS delivers about 6.5 times more detail than a conventional CD format (16bit/44.1kHz), listeners can enjoy a better and a more realistic sound quality. 24-bit/44 to 192kHz is the music industry norm used in the mastering process during sound production. However, the result of high resolution music files has to be compressed down to 16bit/44.1kHz so it can be stored into a single CD due to the memory storage shortcomings (~700MB). To produce the MP3 format, the high-resolution audio is compressed even further to 128 to 320kbps for the convenience of file size. These compressions remove the enormous amount of the details of the original recording because of memory storage limitations and listeners will never be able to hear the details. 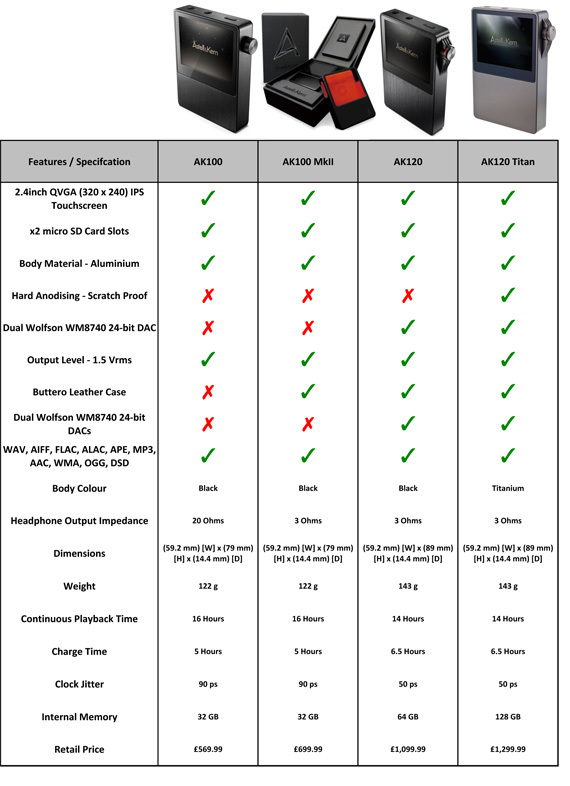 The AK120 MQS Portable System goes beyond the standard Hi-Fi specifications. The AK120 Titan not only meets the standards of Hi-Fi audio, but also utilizes two DACs (digital to analog converters), maximizing the dual-mono set up to isolate the left and right audio channels completely separate. In result, it delivers broader dynamic range and wider soundstage, so that you can enjoy even more realistic music. The AK120 Titan offers very intuitive user experience through a more robust and sensitive touch screen. The 2.4 inch touchscreen and the integrated hardware control buttons on the right and left side of the AK120 Titan make setup quick and easy. Now with an updated and intuitive graphic user interface of the AK120 Titan, find your favorite tunes quickly even without taking it out of your pocket. The curved design of the volume wheel guard provides additional protection to the volume wheel. The AK120 Titan not only meets the standards of Hi-Fi audio, but also utilizes two DACs (digital to analog converters) maximizing the dual-mono set up to completely separate and isolate the left and right audio channels. As a result, the AK120 Titan delivers broader a dynamic range and wider soundstage so that you can enjoy an even more realistic music experience. Enjoy great MQS music for up to 14 hours, this is possible thanks to the same ultra-low-power design unveiled with the AK100. The AK120 is equipped with dual microSD card slots and supports up to 192GB of storage space. The AK120 comes with 64GB of high-speed internal flash memory and dual microSD memory card slots capable of supporting up to 64GB of memory in each slot. Store up to 192GB of high-resolution audio. The additional memory card slot is an important feature as 24-bit album recordings will soon be released with music files stored on microSD memory cards. For a mainstream album, LP (vinyl) records would be considered as first generation, second generations are cassette tapes, and Compact Discs (CDs) are the third and current generation. Fourth generation albums are considered as MQS albums that are released in high capacity microSD memory cards. Comfortably enjoy two albums at once through the dual memory card slots of the Astell & Kern. * The Astell & Kern supports MQS high-resolution music stored on microSD cards. 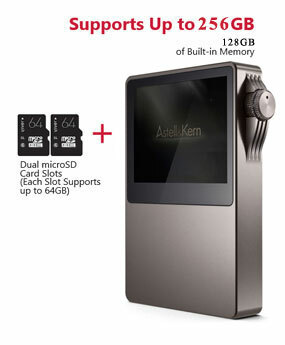 Dual MicroSDHC port capable to expand the total amount of internal memory of the Astell & Kern AK120 up to 256GB.